Looking for independent and player drive 2019 BBCOR bat reviews? After measuring barrel sizes, exit speeds, compression tests, swing weights and a number of other factors we wrote a review for each 2019 BBCOR bat. You can see and sort that list below. Or you might like looking at our Frequently Asked BBCOR questions. There are more wood bat brands than most people have ever heard of. We try and keep track of several of them here. We have also hit with the vast majority of these and put our wood bat ratings and recommendations on the individual reviews. See our wood bat reviews. Now that you have narrowed down the best choices for your 2017 BBCOR bat, you may have some questions. There are several we have fielded and think this might be a good place to answer some of the most commonly asked questions about BBCOR Bats. What is a BBCOR Bat? Will BBCOR bats be legal in 2019? Yes, since 2014 BBCOR bats have been the standard for high school and collegiate play. There is not even a rumor that BBCOR bats standards will change anytime soon. New USA Bat standards will not effect BBCOR players. Can BBCOR bats be legally rolled or shaved? Most agree that rolling a BBCOR bat is illegal. Everyone agrees that shaving a BBCOR bat is illegal. We discuss the concepts of shaving and rolling bats here. In short, we never recommend it for a host of reasons. Not the least of which are the bats duraiblity and it is flat cheating. Can BBCOR bats be used in little league? It depends on the league within Little League. Major division and below requires USA Bats. Intermediate (50\/70) and Junior League Baseball divisions can use either BBCOR or USA. Senior League Baseball must use the BBCOR standard. Some other leagues for youth players that are requiring USA bats are also allowing BBCOR bats. But, you’ll need to check with the local league to see their policy. Can BBCOR bats be used in USSSA? Some 13U and 14U USSSA leagues may allow BBCOR bats. But, you’ll need to check with that specific league. Although BBCOR bats have less pop than USSSA baseball bats the younger leagues are still required to swing a USSSA and not a BBCOR bat. We are not sure why anyone would want to do this anyways. Do BBCOR bats need to be broken in? do not need to be broken in. Do BBCOR bats lose pop? Yes. Both composite and aluminum barreled BBCOR bats lose their pop over time. There is some argument as to when this begins. Some aluminum bats can hold their pop for years and years and thousands of hits. Some composite barrelled BBCOR bats appear to keep getting hotter and hotter over the years. But, in terms of pure physics, aluminum begins to break down with micro dents and composite BBCOR bats are designed to never cross a certain line of performance without breaking. Do BBCOR bats have less pop? times on this site, the length of the sweet spot and barrel size can be dramatically enhanced with a composite bat even if the peak performance is equal to wood. Do BBCOR bats go dead? several years and several thousand hits. Sometimes micro dents on aluminum barrels can affect performance in a noticeable way. It would be unlikely for this occur with a performance BBCOR aluminum barrelled bat within the first few thousand hits. Composite BBCOR bats tend to crack and break when they officially lose their pop. Are BBCOR bats composite or aluminum? Some BBCOR bats are made of composite parts while others are aluminum. There are three types of composite BBCOR Bats, roughly: Some have a handle that is composite and the barrel aluminum (these are called hybrids). Others are made of a two pieces that are both composite. (These are called two piece composites) A few are made of a single piece of composite. (These are called single piece composites. Are BBCOR bats legal for pony league? Yes. Colt 16U and Palomino 18U Pony League players are required to use BBCOR Bats. Other PONY leagues can use BBCOR bats as well as the new USA Bat standard. Are BBCOR bats legal for high school? Yes. BBCOR bats are legal and required for high school (NFHS). No other bats are allowed in high school play. Single piece wood bats are considered BBCOR bats. Are BBCOR bats legal for babe ruth? It depends on the Babe Ruth League. 13U and 15U Babe Ruth leagues can use either Babe Ruth or USA Bats. Under 13U leagues cannot use BBCOR and must use the new USA Bat. Are BBCOR bats better than wood? es. They might not have a maximum trampoline greater than wood, but the controlled swing weight and larger barrel size make them preferable to wood bats. In other words, wood bats are more difficult to hit well than a good BBCOR bat. Are all BBCOR bats drop 3? BBCOR test that they weigh no less than 3 ounces less than the bat is long (measured in inches). Are all BBCOR bats the same? Absolutely not. We spend a considerable amount of time hitting with BBCOR bats, and have for several years, different BBCOR bats feel much different. When are BBCOR bats required? Leagues differ, but most start around the age of 13 or 14 and run through college baseball. Although, some college divisions don’t allow BBCOR bats, only wood. Are all wood bats BBCOR? single piece wood bats are considered BBCOR. Do note, several composite wood bats are made of multiple pieces and are only BBCOR if they are stamped as such. Where to buy BBCOR bats? What BBCOR bats are illegal? A few BBCOR bats in the last few years have been banned. When the standard first came out there were a few. We wrote about a an article discussing illegal BBCOR bats here. What BBCOR bats are colleges using? Colleges use different types of BBCOR bats. However, they are almost always the name brand bats. Many companies have deals with serious baseball schools and pay them sponsorship dollars to use their bats. As a general rule, expect the most recent Easton, Rawlings, Louisville Slugger and DeMarini BBCOR bats to be used at most colleges. What BBCOR bat has the biggest sweet spot? Barrel size and sweet spot size are not one and the same. But, they are likely correlated. We measured the barrel sizes of most BBCOR bats. How long do BBCOR bats last? It really depends on the type of bat. Some break early. Those are usually composites. saw most balanced it likely means the lightest swinging bat for its size. It depends on the length you are looking for. We talk about the a the most balanced BBCOR baseball bats. What does BBCOR bats stand for? What is the Difference Between 2016, 2017, 2018 & 2019 BBCOR Bats? The short answer is not much. If anything, the 2017 market has seen a surge of single piece hybrid bats. They give the stiff feel of an aluminum bat but lower the swing weight by using an extended composite end cap. Both the 617 Solo and Axe Hyperwhip, that made the best BBCOR 2017 list above, are single piece hybrid bats. And, both bats, are also new for 2017. What BBCOR bat has the most pop?? Almost every BBCOR bat on the market meets the .50 BBCOR standard somewhere along the barrel. But, better bats tend to have a longer sweet spot along the length of the barrel and others, still, meet the standard at different pitch speeds. Almost every BBCOR bat on the market meets the .50 BBCOR standard somewhere along the barrel. But, better bats tend to have a longer sweet spot along the length of the barrel and others, still, meet the standard at different pitch speeds. As a general rule, more expensive bats tend to do better at mulitple pitch speeds and longer across the length of the barrel. 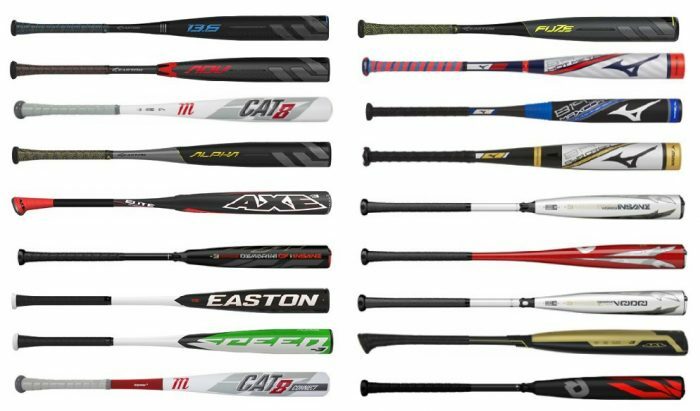 If we accept that rule, then bats like the 917 Prime, CF Zen, Rawlings Quatro and Easton Beast have the best pop. But these are, at best, debatable claims. What are BBCOR bats made out of? There are two types of material BBCOR bats are produced from. Composite is a type of plastic that performance bats often use. Aluminum alloy is a type of metal some other bats implement. Some bats use a combination of Composite and Aluminum and are referred to as Hybrid bats. What is a Drop 3 baseball bat? The drop of a baseball bat is the numerical difference between the length of the bat in inches and the weight of the bat in ounces. A drop 3 bat, as one example, can be of 33 inches and weigh 30 ounces. All BBCOR bats are drop 3 bats. As such, the best 2017 BBCOR bats are also the best drop 3 bats. What is a BESR certified bat? TBESR is the bat standard that existed before BBCOR. It stood for Ball Exit Speed Ratio. It did not determine the exit speed of bats after they have been worked in and was therefore eventually scrapped for the current BBCOR standard.